We recently had a lot of fun putting together a simple website for I Dream of Jewelry, which is the business name for Jamie Lansing, a local handmade jewelry artisan. Jamie became our client in a novel way. We donated a year of website hosting and a basic website for the silent auction of the Niskayuna Cooperative Nursery School. Jamie bid and won. Jamie already had a successful storefront on Etsy. 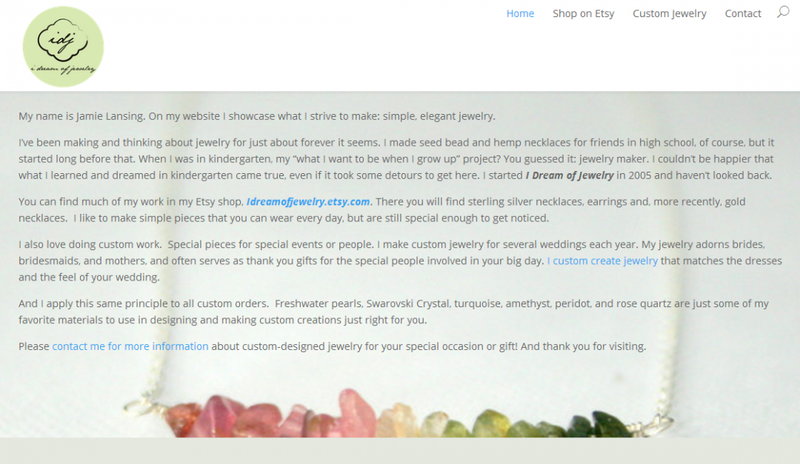 The task was to make a simple website so that Jamie could otherwise market her jewelry. We used the Divi theme from Elegant Themes and set up three basic pages: a homepage, a page related to custom jewelry, and a contact page. For many small businesses this type of simple brochure website may be enough, or at least a good place to start online. The theme is easy to navigate, looks good, and is responsive, meaning it adjusts to screens of various sizes, important for website visitors on smart phones and tablets. We also incorporated some code from Etsy itself, which permits the display of items for sale directly on the website. We helped Jamie to integrate her business Facebook and Instagram accounts into the site. We also provided Jamie with some branding and marketing assistance. The website is pretty simple, but we are happy about the way it turned out. And most importantly, so is Jamie. If you are in the market for affordable, elegant, beautiful jewelry, check out I Dream of Jewelry.